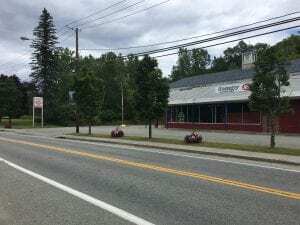 As the Adirondack Chapter of the Nature Conservancy was looking to improve its Boquet River Nature Preserve in the Town of Willsboro, they considered the needs and aspirations of the small community where the preserve is located—right in the middle of town. For one, a school in town was converted to an assisted living facility just a few steps away from the preserve. And the town’s comprehensive plan was focused on merging nature and recreation into its quality of life and tourism economy. 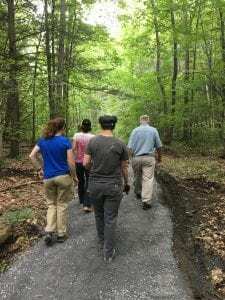 So the Conservancy brought in professional trail builders — Tahawus Trails, LLC — who recommended a 1.5 mile loop accessible forest trail in the uplands portion of the preserve that could be used by walkers, runners, bikers, strollers – and wheelchairs. And with landlock salmon now coming up the Boquet River, it also made sense to make improvements to the preserve’s river trailhead at the town boat launch at the end of Gilliland Lane, adding step-stones down to the river and some trail upgrades. 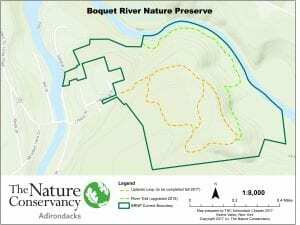 “We were looking at improving our nature preserves and there was potential here that wasn’t being met,” said Connie Prickett, director of communications and community engagement for the Adirondack Chapter of the Nature Conservancy. 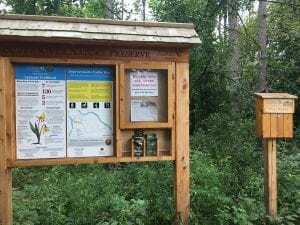 The trail opened this month and is the longest accessible trail, other than John Dillon Park in Long Lake, that travels deep into forest, Prickett said. Most others are less than a quarter mile long, she said. The accessible trail, which we walked in late August, does offer a quiet escape from the downtown with thick woods surrounding the trail. It’s a gentle, easy stroll that meanders interestingly. You can do the entire loop or use a cut-through to shorten it. What makes the new loop trail accessible, according to Federal Trail Accessibility guidelines, is width (5.5 feet); the compacting of the dirt and crushed stone to make the trail stable, so wheels can travel over it; and the grade, which must meet specific qualifications based on percentage of grade for specific amounts of the trail. That users can walk side by side on the wide trail is a bonus, and a quality that Prickett thinks helped make Henry’s Woods in Lake Placid such a popular spot and a good model. She consulted with them for ideas for the preserve’s uplands trail. The Uplands Trailhead begins behind the Champlain Valley Senior Community and the Paine Memorial Library at a new, large accessible parking area with room for two vehicles to park with room for loading and unloading. Turn on S. Library Street and keep right until you arrive at the parking area. Gillilland said mills have left small towns like Willsboro in the Adirondacks, but tremendous natural assets and lands on which to recreate remain as economic drivers. 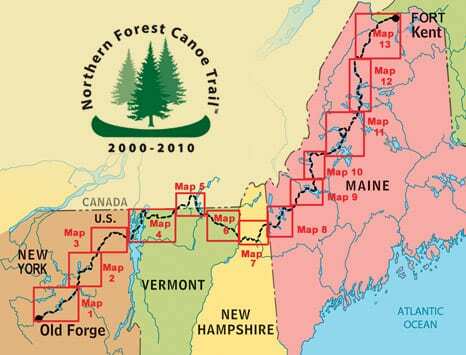 Now he’s hoping to wrap the new trail in with the assisted living facility and promote the idea of reconnecting with nature to put off mental decline. Additionally, there is interest in turning the now-empty IGA grocery store on Main Street into a maker space and having another entrance to the new trail begin there. 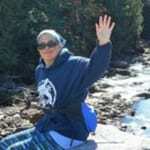 Tracy Ormsbee is the new publisher of the Adirondack Explorer. 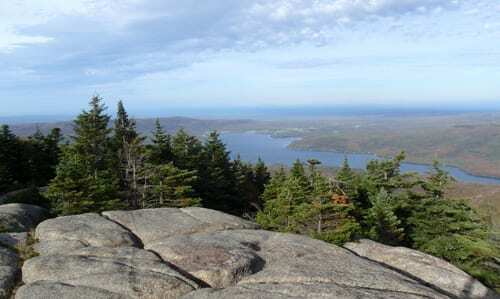 When she’s not working – and it’s not black fly season – you can find her outdoors hiking, running, paddle boarding or reading a book on an Adirondack chair somewhere.